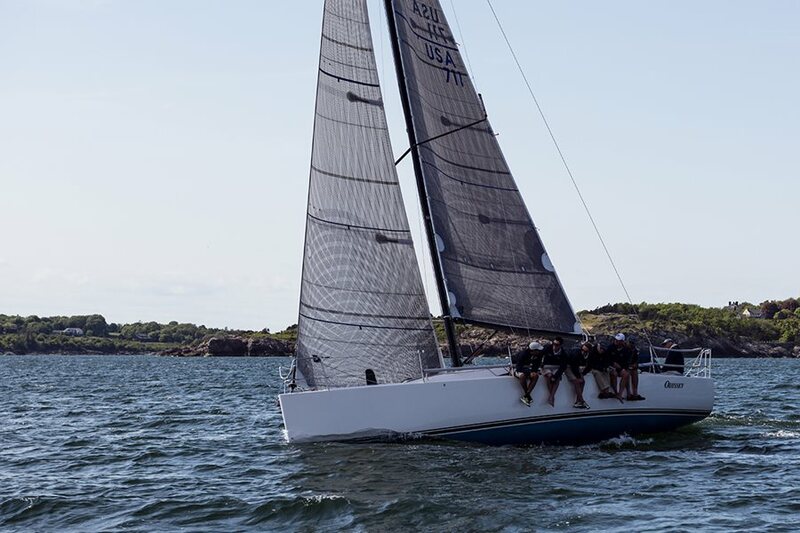 “Why can’t I point?” is a question commonly asked post-race at bars and yacht clubs around the world, and it’s a tricky one to answer. In the second installment of our four-part series on troubleshooting pointing issues, Quantum’s Dave Flynn discusses the transition phase: the velocity it takes to go from needing to create heel to having crew fully hiking. There are many possible, often interrelated, reasons for pointing difficulty. It is a particularly vexing issue for handicap sailors to diagnosis, since fundamental differences between boats can make it an impossible task. To help sort through the myriad causes of poor upwind VMG, I’ve broken the problem into four air scenarios: light air, transition phase, optimum/medium air, and heavy air. This article focuses on the transition phase. The transition phase is the velocity it takes to go from needing to create heel to having the crew fully hiking, typically between 8-12 knots depending on the horsepower-to-weight ratio of the boat. The higher the ratio, the earlier everyone is hiking. Trimmers need to be active in this phase, since every puff is a chance to accelerate and point. Initially, the trimmer should ease the sheets slightly to let the boat accelerate and then sheet on to gain height. But how hard can you trim? When the boat starts to slow too much, you’ve gone too far. The process is a bit like taking little bites of weather at every opportunity. Bigger puffs may require further de-powering. Dropping the traveler and adding backstay is the next step as soon as the crew is fully hiking. The crew needs to feel and respond to heel. How many crew go up to the rail is a function of the size of the velocity increase. If it’s a big puff, everyone goes. Reverse the process in the lulls as the boat gets flat. In the transition phase, it’s better to err on the side of a little extra heel if you are trying to point. Once everyone is on the rail, you can probably slide a body or two aft. Always keep the weight tightly packed together, and never sit on the cabin top! One crew member should be designated to call the changes in breeze velocity. In the light stuff you need to be very careful about over-steering, but in the transition phase you need to be more active. Be ready to have the bow come up to meet the puff or you lose the opportunity to gain height. Feel the boat, and don’t let it over-heel. Trimming and crew weight will be moving to help, but you still need to steer to control heel. In the light spots, be careful not to bear off too far and chase the boat speed. Coast for a moment, and then let the boat speed drop. As you slow, the apparent wind will move aft and you may not have to bear off at all. If you use target boat speed, remember that it is volatile in the transition phase. A small puff means a big increase in boat speed, and you may have to accept a deterioration in a lull. Don’t get too fixated on target speeds in this range. If you are adjusting the rig for conditions, I would err on the side of more power in the transition phase. Click here to read Part 1 focusing on pointing in light air.